Welcome to my website. I hope that you will check back from time-to-time as the content will change frequently. Please feel free to use the contact button above to send me personal email. Nowadays, live concerts take place in all sorts of venues, including virtual reality environments. Learn how to locate a virtual concert space, invite an audience, perform live for friends and strangers, and even make money! Click here to see the electronic handout. George headed the Technology Committee for this conference, coordinating a substantial number of technology sessions. With the Right Tools, Any Student Can Learn to Improvise! The lost art of classical improvisation need not stay lost! Start with an acoustic or digital piano, add user-friendly MIDI playback software and appropriate MIDI files. Then, sprinkle in some creative guidance from you, the teacher. In this environment, students at all levels will be ready and eager to create music spontaneously. In preparing this session, George organized all of the MIDI files from the Music Pathways method into a progressive curriculum of improvisation exercises. These files were authored by Paul Sheftel who has graciously offered them as a free download to people who attended the session. George's tools for the session included Home Concert Xtreme and Classroom Maestro. The programs were available at a discount during the conference. If you wish to purchase these programs at the discounted price, email George before September 1, 2009. Click here to see an outline of the session. Click here to view the improvisation curriculum. Right-click here (or Control-click on the Macintosh) to download the improvisation curriculum. Click here to download Paul Sheftel's MIDI files for Music Pathways. George managed the technical issues involved in connecting 2 Disklavier pianos that were 1,000 miles apart. Inspirational long distance teaching demonstrations were given by Paul Sheftel and Jennifer Snow. With TimeWarp Technologies' Internet MIDI software program connecting the two pianos, Mei-Ting Sun played a bockbuster concert from the salon at Yamaha Artist Services, Inc.
George lead a group of distinguished colleagues who presented an all-day workshop titled Studio Without Walls. The day consisted of presentations and sessions on all aspects of long distance teaching in real-time and time-shifted contexts. Electronic handouts are available here. This session was presented with colleague, Shana Kirk. Click here for the electronic handout. Music Labs 101: How to decide what kind of music lab is right for you? But the Student Is NOT In The Room!!! George joined duet partner, Shana Kirk, in a presentation called Multimedia in Concert Performance: Artistic and Practical Ways for You and Your Students to Engage Audiences Fully and Build a Popular Following. For a dozen or so years, George has worked with the Lyell B. & Patricia K. Clay Foundation, Inc. and Yamaha to improve music education in the state of West Virginia. The current initiative is focused on empowering K-12 music teachers in the poorest counties in the central part of the state. On this occasion George participated in training teachers who were recipients of a package consisting of a laptop computer (with built-in webcam), projector, MIDI/audio/music notation software, digital audio recorder, portable speaker, and full featured, portable digital piano. Articles are available here and here. George joined other clinicians in providing a day-long in-service training day for Houston public school teachers. The focus was on using modern, technology-based musical instruments, such as piano lab controllers, silent instruments, and interactive music presentation software. George continued his work with the Minnesota International Piano-e-Competition, supporting the new e-Piano Junior version of the competition by providing a variety of technical services. On June 19, George set up a Remote Lesson connection between Disklavier pianos at the MacPhail Center for Music in Minneapolis and Yamaha Artist Services in New York City. This made it possible for the 11-year old Alice Burla to perform in Minneapolis from New York. During the competition, George recorded all of the solo piano performances on the Disklavier with coordinate video. On July 8, he gave a presentation on the history of the piano titled 300 Years and Counting! During the spring, one of George's piano students took remote lessons with from George's studio with Shana Kirk in Denver, Jennifer Snow in Los Angeles, Stella Sick in Maple Grove (MN), Mario Ajero in Nacogdoches (TX), and Lisa Yui in New York. These lessons were made possible by virtue of video conferencing and piano-to-piano connections using the unreleased Remote Lesson feature of the Mark IV Disklavier. On June 17, a 5-piano connection was set up so this particular student could do a run-through of Debussy's Passepied for four of these teachers--all at one time! George was involved in four presentations at MTNA this year. Two of them contain links (below) to electronic handouts. George and his piano duet partner, Shana Kirk, presented artistic and practical ways for professionals and students to engage audiences fully and build a popular following by adding a multimedia dimension to their concerts. Themes from the Planets by Holst, arranged by Phillip Keveren for piano and tone module with additional arrangement for digital piano by Shana. Musical imagination is an elusive quality that separates enchanting performances from very good performances. Janet Lopinski and George were joined by colleagues Scott McBride Smith and Peteris Zarins of the Before and After team from MTNA's Pedagogy Friday 2007. Together they shared their insights into the development of this musical dimension. Shana and George did a showcase presentation in which they demonstrated the forthcoming, long distance teaching program called Internet MIDI as well as Classroom Maestro and Home Concert Xtreme. Teacher interest was keen. 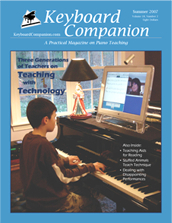 George is the Technology Editor for Keyboard Companion, a publication for piano teachers. He made a brief contribution to the showcase. 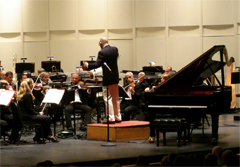 This year, the Minnesota International Piano-e-Competition is sponsoring a junior competition that is open to young pianists who are no older than 17 years of age as of July 4, 2008. During the virtual auditions, George will record the contestants using a Mark IV Pro Disklavier that is synchronized to digital video. From February 14-16, 2007, the screening during will listen to and watch the playback at Yamaha Artists Services in New York City. Contestants who pass this round will be invited to the United States to continue the competition in person. This session included a live, Internet connection between two Disklavier pianos with synchronized video conferencing. This was an e-poster session that George presented on a forthcoming software program called Internet MIDI, formerly from TimeWarp Technologies. Dr. Sara Hagen (Valley City State University) has invited George to make a video conference presentation to her Music Business Seminar class on the subject of music software development. George headed a team of esteemed piano pedagogues who organized a dozen technology sessions and an additional pre-conference day that was devoted to technology in piano instruction and performance. George wrote the cover story for the Summer 2007 issue of Keyboard Companion magazine. The title of the article is Three Generations of Piano Teachers on Teaching with Technology. The article profiles Serena Mackey, George Litterst, and Paul Sheftel. It includes narratives detailing their professional use of technology, lists of their studio tools, and a timeline called Technology Highlights in the History of Pianism. George assisted guest conductor, Loras John Schissel, and the Phoenix Symphony in a performance of Rhapsody in Blue in which George Gershwin made a rare posthumous appearance. Read about it here. Responding to increasing requests for long distance lectures to be presented via video conference, George gave a multimedia music history lecture to Dr. Stella Sick's music history class at Hamline University. Details can be found here. George presented the concept of teaching piano over the Internet at the recent NAMM show in Anaheim. Click here to watch the video and discover how a teacher in Los Angeles can teach a student in New York City. If both you and your student have a Disklavier Mark IV piano, you can have a real-time lesson over the Internet in which you each play each other's instrument.